India's Congress accuses Modi's party of hogging helicopters - SABC News - Breaking news, special reports, world, business, sport coverage of all South African current events. Africa's news leader. Chartered aircraft are a critical part of elections in India. India’s main opposition Congress party says it is struggling to find enough helicopters to ferry its leaders ahead of a general election, accusing Prime Minister Narendra Modi’s ruling party of hogging resources. Chartered aircraft are a critical part of elections in India, a massive country of 1.3 billion people where national leaders like Modi and Congress President Rahul Gandhi often address multiple rallies in a single day. 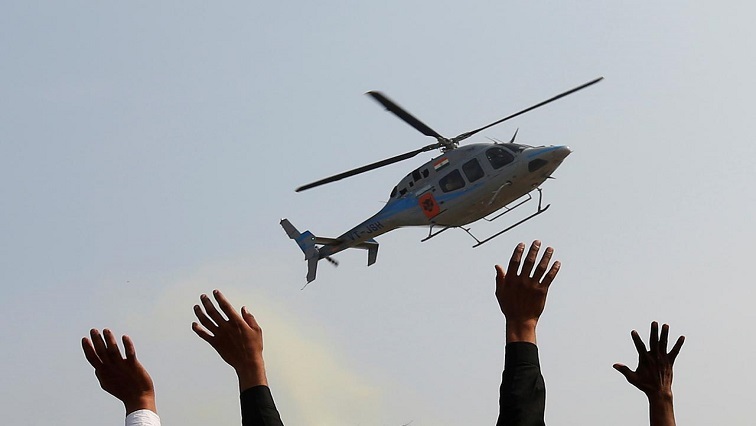 But an official with Congress, which is hoping to make a comeback after a massive electoral thrashing at the hands of Modi’s Bharatiya Janata Party (BJP) in 2014, told Reuters on Wednesday the ruling party had already reserved much of the entire available fleet of helicopters in the country for 90 days instead of the usual 45 days. The official declined to be identified, but senior party leader and former minister An and Sharma said the BJP had”preempted everything” ahead of the election due by May. The BJP denied the charge, calling Congress a “machine oflies”. The alleged shortage of aircraft for Congress reflects the widening gap in resources available with both parties as theyhead into what will be the world’s biggest elections. In 2017/18, the BJP’s total income including donations stood at 10.27 billion rupees ($144 million) compared with 1.9 billion rupees for Congress, according to the Association for Democratic Reforms (ADR), a Delhi-based advocacy group that examines political funding and candidate disclosure forms. More than half the income for both parties came from unknown sources, an ADR analysis showed. This entry was posted on 23 Jan 2019,02:34PM at 2:34 PM and is filed under World, Homepage Latest Stories Slider. You can follow any responses to this entry through the RSS 2.0 feed. Both comments and pings are currently closed.